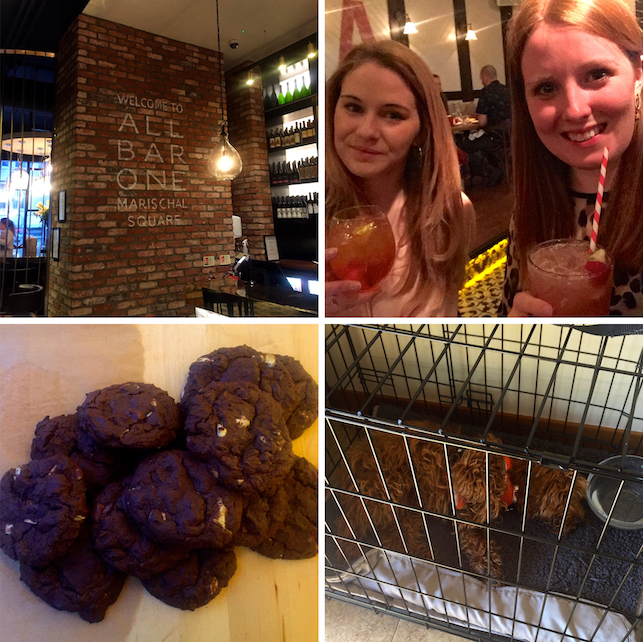 (from top left) On Tuesday night my flatmate and I went to the new All Bar One in Aberdeen for tea. Then into a few different bars for cocktails. Friday was a stressful day so I relaxed by making cookies to take on holiday at the weekend. The weather was lovely on Sunday so we went for a long walk - I think Coppers position says it all. It's hard to believe this post in just covering two weeks and not a whole month. During my last week in Aberdeen I managed to do uni work and enjoy a night out with my flatmate which started at All Bar One for dinner and Cocktails. On Wednesday I went home to my boyfriends and on Thursday I made it home to see my parents for a few days before going to Aviemore with the rest of my family. Excited to spend time with my cousins and my uncle insured me to drive his car too which was even more exciting. We got our yearly walk round Loch an Eilein on the Sunday because it was such a nice day. I was so busy for the rest of the week there wasn't time for this blog post on any others - oh well! 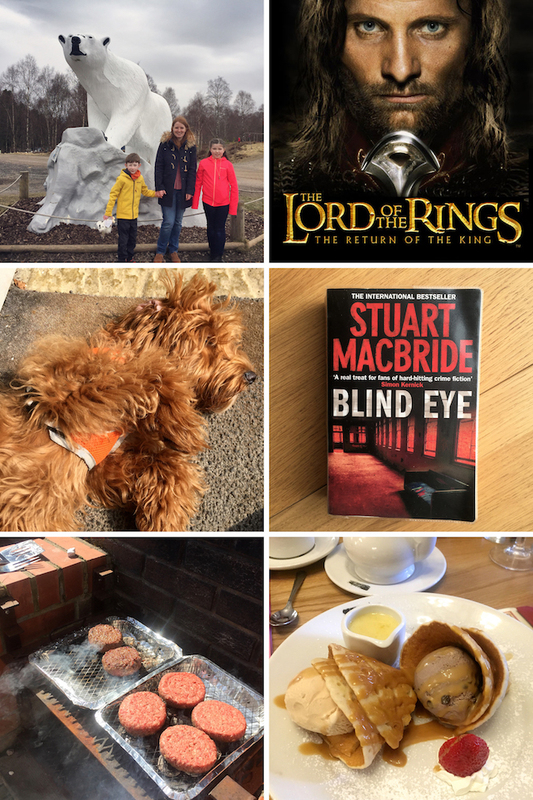 (From top left) Adventures at the highland wildlife park to start the week - we even saw the baby polar bear. Stayed up really late watching 'The Lord of the Rings' with my little cousin. We enjoyed time sitting outside in the sunshine this week - especially Copper. I finished reading 'Blind Eye' and really enjoyed it. BBQ burgers for lunch felt like summer. Dinner at the Cairngorm hotel on Friday to finish off our holiday. Our holiday in Aviemore got off to a great start with sunny days and lots of time to spend with my little cousins. Even if I did have to finish off some uni work in my spare time... Not that there was much of it. I felt like I was going from one activity to the next all week with no time to do nothing. On Tuesday we headed to the highland wildlife park with hopes of seeing the baby polar bear which we did - all be it in the distance. It was the coldest day of the week but we still had a great time seeing all the animals. Quite a lot of the rest of the week was spent outside enjoying the sunshine. Half of our group left mid week but that meant I could spend more time with my littlest cousin. On the Friday night we headed to the Cairngorm Hotel for tea. A family tradition and their mince and tatties are always delicious. By lunch time on Saturday I was back again being picked up by mum, having lunch at home with my parents then going to my boyfriends for a takeaway and a chilled evening. Sunday morning was chilled too - we made breakfast together and went for a walk down the beach. In the afternoon the sun was still shinning so we took the chance to cut the grass before he gave me a lift home again. The past two weeks have been so full on I'm excited to take it slow next week and enjoy some time at home with mum and dad. Check out more of my holiday photos over on Instagram.